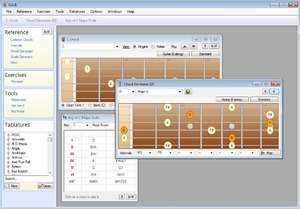 Guitar and Bass is a free Windows program for fretted instruments, such as Guitar, Bass, Banjo, and Mandolin. (New instruments and tunings can be added too). You'll get everything a musician need, including: Scale/chords/intervals references and exercises. A Tablature viewer and editor. For security reasons, you should also check out the Guitar and Bass download at LO4D.com which includes virus and malware tests. Additional screenshots of this application download may be available, too.